After early breakfast, you will be picked by driver guide from your hotel at 7:30 am and head to Jinja. From Kampala it’s about 1 ½ hours to the spectacular Bujagali Falls. After being briefed, about rafting. Rafting starts for 5 – 31 kms – 5/6 hours rafting and you will have the chance to watch the local fishermen and the fantastic bird life. Alternatively choose to go for wild or mild. Here you choose to raft in the paddle-powered boats for one of the wildest raft rides on the planet, or opt to be rowed downstream by our professional guides in the safety raft. After a buffet lunch you will hit a series of more wild rapids, thereafter an evening BBQ will be served before return to Kampala. 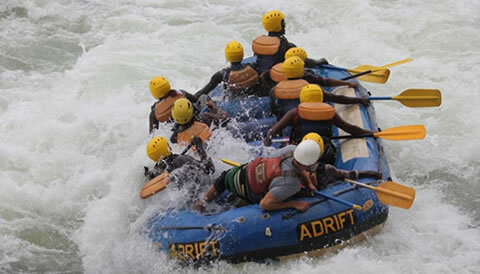 The 1 Day Rafting in Jinja package excludes expenses of personal nature like: Air fare, Visa, drinks, laundry, tips to local guides, telephone, porter fee while trekking, personal insurance, personal shopping bills and cigars.